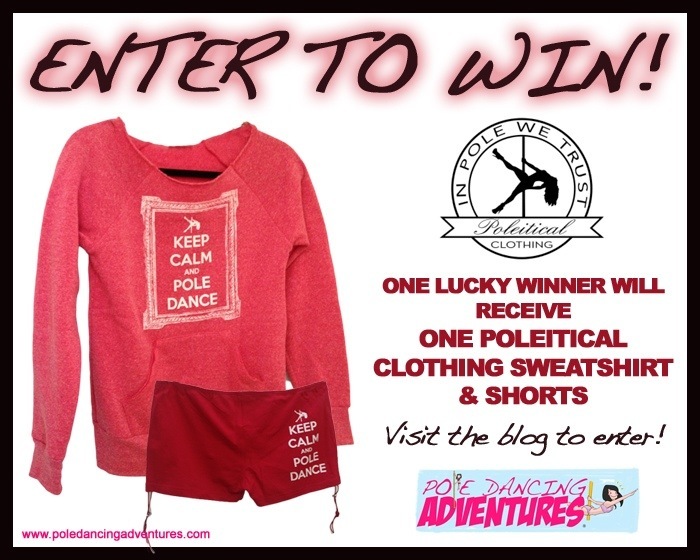 I am SO excited to announce a new Poleitical Clothing Giveaway with Pole Dancing Adventures!!! Best of luck, and Happy Poling! Actress, writer, consumer of too much sugar, cat mom, dog auntie, pole enthusiast, amateur foodie, local explorer. Often mouthy, occasionally political. Posted on February 5, 2013, in Uncategorized and tagged apparel, contest, free, freebie, giveaway, Keep Calm and Pole Dance, Leen Isabel, off the shoulder sweatshirt, perfect pole short, pink, pole, pole dance, pole dancing, Pole Dancing Adventures, pole fitness, Poleitical Clothing, red, shorts, workout. Bookmark the permalink. 32 Comments. Thank you! So glad you like them – good luck! Glad you think they’re cute! Best of luck! Really hope i win! they will be awesome to wear at the studio! Thanks! They’re great shorts – I wear them almost exclusively when I am in class! Good luck! i wanna win this awesome things! Glad you are doing the give away & REALLY glad to find your blog & etsy store! Great Superwoman by the way! Thank you!!! That was one of my first true pole photos – and one of the earlier tricks I was able to do decently! 🙂 Glad you like our line and my blog! I found this blog through the giveaway. I just started doing pole a month ago, and am loving it!! Thanks for keeping such a great blog. I would love to win the keep calm sweater and shorts ❤ They are so cuteee! These are adorable! I’m in the process of getting in as many entries as possible! Thank you! I have the sweatshirt in grey – I never want to take it off! From visual readers perspective, the color scheme (Black back ground with white and blue letters.) is very hard for me to read. That being said, I love finding new pole geek people. Great find for me. I will be back.